I sorta think the above flyer says it all, but just to S-P-E-L-L it out (in honor of my friend Roseanne, who LOVES to spell things out loud): my hood's (and perhaps the city's) best new-ish accessories shop TenOverSix is having a HUGE sale this weekend. Now, I'm too po' and freelance to buy anything sadly, but those of you with actual jobs would be FOOLS not to take advantage. Just look at the lines listed above! Plus, the brick courtyard is super cute and if the weather is anything like today, it might just be nice to peruse. Peruse away . . . and don't cry for me, Argentina. P.S. 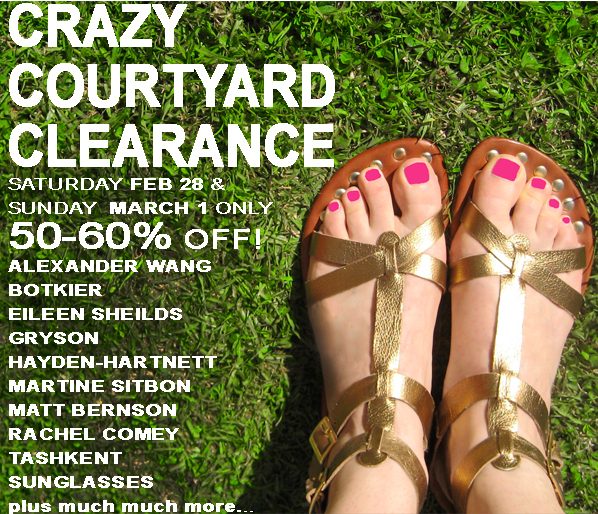 Turns out that Kendo–that great women's limited edition sneaker store–is having a closing sale too. Starting Thursday, sneakers are less than $40 each. Sad. But a great bargain, if you need sneaks.